my mother and i are doing “NO SUGAR JANUARY”. wanna join us? it doesn’t have to be super strict: don’t worry if you have the occasional guest over and they bring apple pie (like our friends did last night). but we’re talking everyday, mindless sugaring. we’re off baked goods, refined sugar, artificial sweeteners, anything like that. allowed: honey, agave nectar, fruit, and for me, red wine. just a little red wine, though. so, what to do when a case of the sweets overwhelms you? fruit is SO sweet when you don’t eat sugar. when you do eat sugar, fruit never quite satisfies. go off sugar for a few weeks and you will LOVE fruit forever. a couple squares of very dark chocolate, or dark chocolate covered goji berries or cranberries. believe it or not, a cup of tea or coffee! you want something sweet, but even more importantly ~ you want to be treated. or you just want a break. so sipping on a hot cuppa can suffice. but i particularly love a sliced honey crisp apple with a cup of mint or camomile tea. heaven! i’m still working on my granola recipe ~ trying to get the agave/honey levels down a little. i think that’s a great way to get a little sweet treat in. and giada has an awesome granola bar recipe i’m going to try. more on that later. 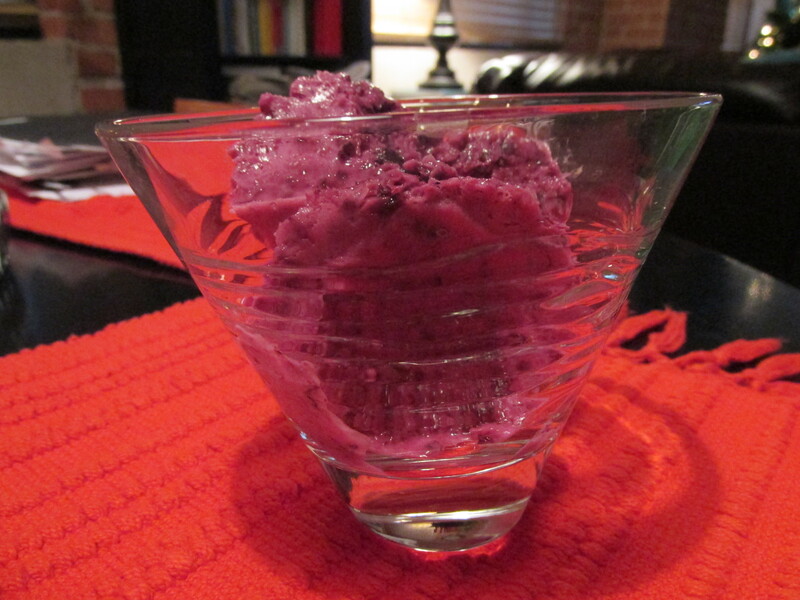 and today’s test kitchen: FROZEN BLUEBERRY YOGURT!!! in a small sauce pan, combine 1/4 cup frozen (but thawed) blueberries, 2 T water, and 1 T honey. you can also add an herb at this time, like thyme or lavender. giada says thyme. i say lavender. i have some more ideas at the bottom too. in a food processor, add 2 cups low fat, plain greek yogurt, a bag of thawed blueberries (a pound? whatever. just put in a lot), 1/3 cup honey, 1/4 cup agave nectar, the juice of a lemon, and the cooled syrup. blend until smooth-ish. put in a container and freeze for 8 hours, and you have some mighty yummy fro-yo! now, the second i tried this, and liked it, i started thinking of all the combos that would be so great. vanilla bean. no need for anything else. strawberry – basil? maybe with a little dollop of mascarpone? oooh ~ what about a cannoli version? with a little ricotta cheese added to the yogurt, lemon, pistachios, and mini chocolate chips? thank you, giada, for your amazing ideas. The frozen yogurt sounds divine! I made popsicles about a month ago with greek yogurt (honey) and blackberries – it was DELISH! Yumm, Toni! Do I see you soon for happy hour? Next Next post: lemony tabbouleh salad.